Available now with a great discount! 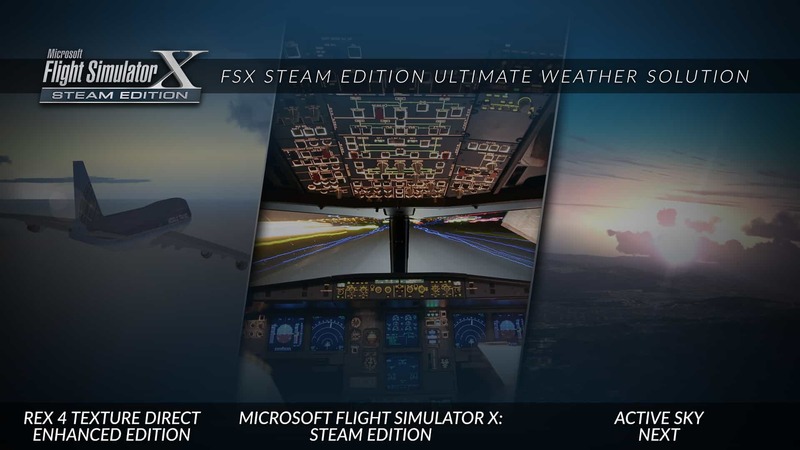 The Ultimate Weather Solution bundle provides a serious upgrade to your flying experience in FSX: Steam Edition. Rex Texture Direct (developed by REX Game Studios) and Active Sky Next (developed by Hifi Simulation) combine to deliver the Ultimate Weather Solution in FSX: Steam Edition by providing enhanced sky and cloud textures (along with ground textures and much more) coupled with a powerful dynamic and real-time weather generator. The Ultimate Weather Solution bundle provides a hugely powerful and endlessly configurable set of tools to deliver realistic weather patterns and visibility conditions to suit your tastes and requirements. To find out more and to take advantage of this fantastic offer, click here.